I got the opportunity to road test and review the Holden Colorado on numerous occassions earlier in the decade. I always thought it was pretty honest, completely no-frills, but a somewhat flawed offering. My main complaints included the really heavy steering, rather noisy engine, hard and somewhat uncomfy interior and a wobbly brake pedal. Then, responding to the market (and no doubt plenty of similar reviews), Holden went back to the drawing board and launched a much improved version. This was my first time driving the updated Holden Colorado and I’m happy to give Holden a big pat on the back for the work they did. It now feels a whole lot better and has the features and interior space to match it with the competition. The aforementioned market, i.e. the buyers, have responded too with the Colorado now easily the brand’s most popular model. 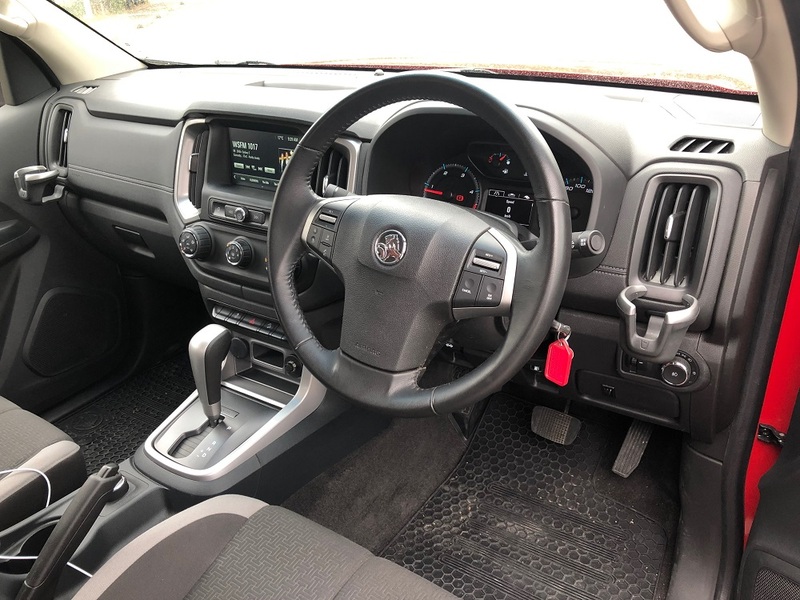 Across the Holden Colorado range you get a 2.8 litre turbo-diesel engine, the only two things you need to decide are whether you opt for the six-speed manual or six-speed auto, and 4×2 or 4×4. My test vehicle had the auto and the 4×4 powertrain, a combo here in mid-spec LT grade that will set you back from $49,190. The Colorado gets along with plenty of purpose – there’s 147kW on tap and this gives you a power to weight ratio of 71.8. This is about mid-pack in the dual-cab power to weight stakes (check out our guide here). Naturally, 4×4 and the auto brings your power to weight ratio down compared to manual/4×2 versions. There’s 500Nm of torque on tap in the Colorado – a good healthy number above many rivals. The engine/cabin is noticebly quieter today and this helps improve overall feel/refinement in the Holden. Holden has focused a great deal on the Colorado steering and ride and handling and the end result is a lot more acceptable, especially for those using their ute as a family hauler. The steering, which was heavy and vague previously, now is lighter and quiet direct…good improvement! The brakes though are still a bit spongy in my opinion, while there remains a small amount of lateral freeplay in the brake pedal (but perhaps less than before). There are good-sized wing mirrors and good visibility all-round from the driver’s seat. The biggest difference between old Colorado and new Colorado is the dashboard. There’s now a dash in there that looks somewhat reminiscent of what you might find in a U.S. pick-up truck. I like the simple and easy to read gauges, simple and well-placed controls and the attractive/functional driver info screen. I’m not a huge fan though of the still rather hard door and console plastics, while the indicator/wiper stalks, to me at least, feel just a bit short for the steering wheel. The Holden Colorado has a larger steering wheel than say the previous Cruze, yet they share the same stalks and this leaves you feeling like you really need to reach around the wheel to get your fingers on them (and I have quite sizeable hands too). One nice addition are the grab handles on the A pillars, while the 210mm of space between the rear of the driver’s seat (in my seating position) and the leading edge of the back seat is on-par with the Ford Ranger/Mazda BT-50 (check out our guide to dual-cab ute rear seat space here). The steering wheel/column remains tilt-only in Colorado, though the height-adjustable driver’s seat helps out in this regard. You don’t miss out on Apple CarPlay/Android Auto or a reverse camera, though at this stage there’s no sign yet of Autonomous Emergency Braking (AEB) in Colorado. The little clip-in cup holders are an optional extra, along with the bull-bar, black alloys, sports bar, hard tonneau cover and the rubber tub mat. The good news is there’s no extra for the red paint – it’s called Absolute Red. As mentioned above, Holden listened and acted – giving the market a much better product that buyers have responded well too. If you’re in the market for a ute you should certainly check it out.